Look at this awesome new product that Stampin' Up! is carrying now. 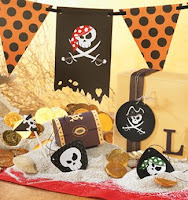 It's a party kit with everything you needs to make your little pirate's birthday something he'll remember. I was so excited to see this product when I got my new catalog on June 2nd, yes, I said the 2nd... I just had to have it so I made my order and had it sent next day air!! Crazy I know, but really what price can you put on a new Idea Book & Catalog!! The only bummer about this product was that I couldn't order it until July 1st and Keegan's birthday is June 18th... That's ok though. It's not often that I'm really ahead of the game, but his next birthday, I'll be all ready to go!! I think he'll make an adorable 8-year old pirate! !